Scotland's head of referees, James Bee, has urged Saudi Arabian football chiefs to punish a player who head-butted official John Beaton. Al Hilal midfielder Salem Al Dawsari earned a red card after thrusting his head towards Beaton during his side's 1-0 derby defeat by Al Nasr. "This type of behaviour is unacceptable in any country and no referee should be treated in this way," said Bee. "Assaults or attempted assaults should be met with zero tolerance." The Scottish FA had responded to a request from its Saudi counterpart to supply officials for the Riyadh derby. Beaton, 33, and assistants Stuart Stevenson and Douglas Ross took charge and the referee produced eight yellow cards and sent off three players. The third dismissal came in stoppage-time at the King Fahd Stadium, when 23-year-old Al Dawsari reacted angrily to a foul awarded against him. After squaring up to Beaton, he then thrust his head towards the Scotsman, earning an instant red card. Al Dawsari, who has been capped 20 times by Saudi Arabia, had to be led away by his team-mates as he tried to confront the referee after the final whistle. 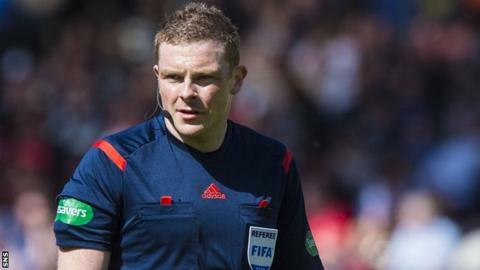 "John Beaton dealt with the incident correctly on the field of play and the appropriate authorities should deal with the matter correctly off it," added Scottish Senior Football Referees Association chairman Bee. "The most important thing for us though is that, thankfully, John does not appear to have been physically harmed in the incident." On arriving back at Glasgow Airport, Beaton told STV: "I can't really comment on it just now. "Obviously the Saudi federation will be dealing with it, so I'll just let them deal with what they need to deal with. "If you've seen the pictures, you've seen exactly what happened. It was an experience, it was an experience. "I'm back, I'm back safe and I can have no complaints about how the Saudis treated us after the game and made sure we were safe."